STEP 1 Locate your meter box, generally found towards the front of a property, near the street. It is typically housed in a black box marked "water". Look for a white S painted on the pavement - the box should be straight in from that. STEP 2 On the face of the meter, there is a large dial and a display of numbers. Read the number display from left to right. Be sure to include the stationary zero. This is your meter reading. Our meters measure water in gallons. Compare that reading to what your bill states as your current or present reading. BBWC is responsible for all maintenance and repairs up to and including the meter. The customer is responsible for all maintenance/repairs from the meter to the house, including the Customer Cut Off Valve. IMPORTANT: Customers should always use their customer valve to turn water off at the street - NOT the BBWC valve. If you have a tool (t-bar) please do not use this to operate our valve. 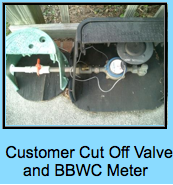 If the BBWC valve is damaged, the customer could be fined for meter tampering. Bogue Banks Water will not turn customer valves off or on. Customers who are out of town will need to contact a plumber, property maintenance company, or neighbor to get help with that. We will turn our valve off in the case of a leak that cannot be stopped by the customer valve and in other emergencies. Bacteriological samples indicate our water is clean and safe!